I just wanted to drop a quick reminder that if you would like to play along with me in August you will want to sign up for the card kit now. This one is another awesome one and I bet it will sell out! There’s a bunch of patterned papers and resist papers in Kraft and white included. I can’t wait to play around with this kit! We get mini Distress Inks in Chipped Sapphire and Festive Berries. I am so glad those are two colors I’ve been wanting but haven’t allowed myself to buy yet. I’m sure you noticed the gorgeous stamp set with all of the star constellations. Plus we get this vented star die and a cute firework stencil. Wahoo! I’ll see you guys soon. Thank you for stopping by! This card took me a while to do but it was a lot of fun! Avery Elle has a new stamp set out called Pixie Dust and it’s just adorable! She’s just so cute! This card did take a while and it’s PACKED with techniques. In order to not make this blog post monumentally long, I am going to to a quick run down of what was done. Stamp the fairy girl with her wand on 140lb watercolor paper using Memento Tuxedo Black Ink. Let it dry. Cover the fairy girl with liquid frisket to mask her off from the background spraying. Let it dry. Mix Luster Mica Powder in Hawaiian Orchid and Deep Sea Dive , or Blue Ice, in a Fine Mist Spray bottle. Spray the background keeping some of each color more concentrated in the top or bottom. Dry with heat tool. Remove Liquid Frisket with included remover and color fairy girl using Zig Clean Color Real Brush Markers and Water Brush . Stamp stars from the Pixie Dust Stamp set on the top half of the card using Versamark Ink and cover with Embossing Powder Sticky. Heat until it changes clear then cover with glitter. Spell out “Fairy Kisses” in Silhouette Studio using Blessed Day Font from http://www.urbanfonts.com . Weld the letters together and cut it out using your Silhouette Cameo 2 . Stamp the sentiment on a scrap piece of paper that you have inked with Picked Raspberry Distress Ink. Also ink up the Fairy Kisses sentiment with this ink. Run “Fairy Kisses” through a Xyron Creative Station with sticker adhesive installed to turn this intricate die cut into a easy to place sticker. Adhere other sentiment using a tape runner or liquid glue. Revel in the beauty of your card! You’re done! Here’s a close up of the fairy girl: Thank you so much for stopping by! Here’s the card I made for my Sister’s recent Birthday. This was surprisingly quick to make and I think it looks pretty nice! I’m still on a bit of a Color Burst kick. We actually sell them in our store now! You can see them HERE. The sentiment stamp is one that I found at a Rubber Stamp Convention and it’s by Rubbernecker. I love how affordable their stamps are and they have some very clever sayings as well. Hopefully I will use some of the other ones I got soon! Click here to buy this stamp from Rubbernecker for just $3.90! The stars in the background were individual star stamps that I rounded up from multiple Lawn Fawn stamp sets. I repeatedly stamped them, rotating the acrylic block to get variation. Everything was embossed with white embossing powder and then I let my Color Burst do the rest of the magic! 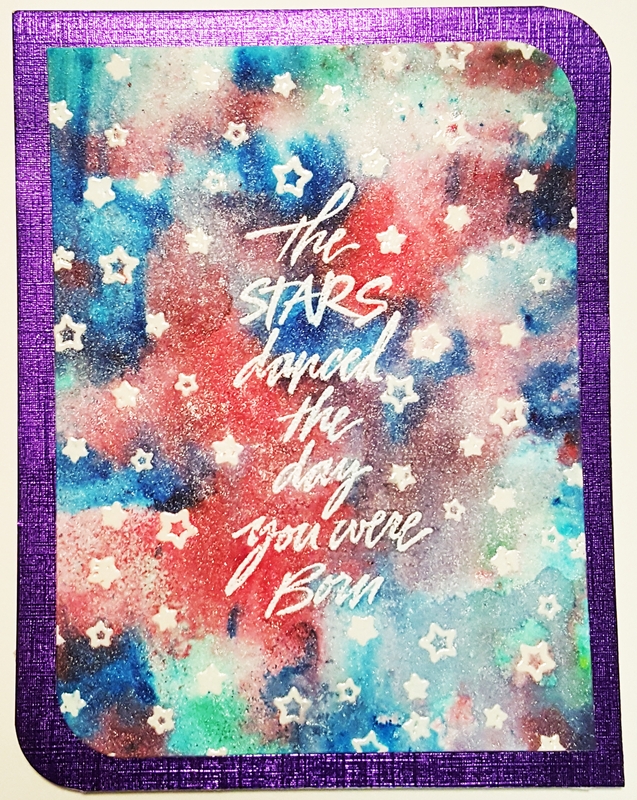 I’d love to redo this same card and figure out how to make the color bursts create a galaxy! That would be super awesome!